The protection of the two layers of plastic sheeting have kept the greenhouse tomatoes going long after the outside ones were killed by frost. 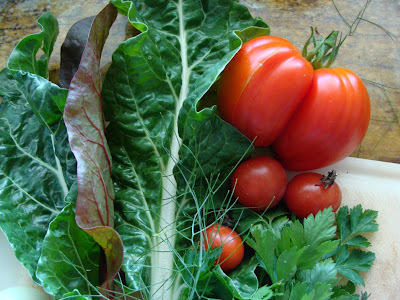 The chard and the parsley are still looking good, too, although the basil has succumbed to the colder weather. The other things that are thriving are the cabbage (white) caterpillars. I haven't seen a butterfly for weeks, but there seems to be a healthy crop of caterpillars on the kale and broccoli plants in the greenhouse every time I go in there. 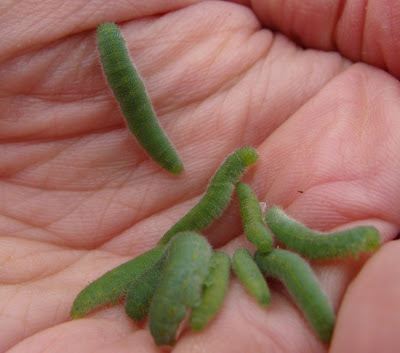 Having feasted on my brassicas, the caterpillars are in turn feasted upon by the chickens. They come running if I go anywhere near their orchard run, in the hope that they'll get caterpillars or something else that's good to eat. 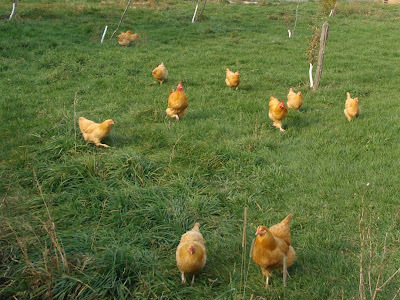 The chickens then convert the caterpillars into eggs for us to eat, so I can't complain too much! I'm jealous that you still have tomatoes growing! I found a green caterpillar in last week's harvest as well. I seem to come from nowhere? I was hoping that our recent frost could kill them all. I'm jealous of the tomatoes too. I haven't had a fresh tomato from my garden for ages. I wish tomato season were longer. Gorgeous tomato! The caterpillars are busy at work in my brassicas also, but my plants are outside.